Aeronautical Decision Making (ADM) is the process defined by pilot training and the FAA that pilots apply to choices when flying. Or, most importantly, when deciding whether to go flying. 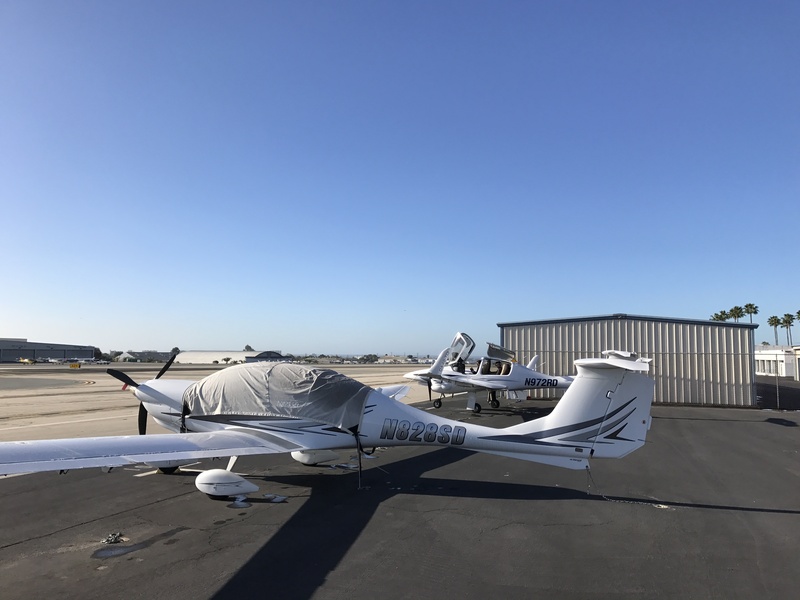 It involves situational awareness, understanding of your aircraft’s performance, frank assessment of the priorities and requirements of the flight, and a rational decision in a timely manner. I found myself doing some ADM as I hurtled down runway two-one and Santa Monica a couple weeks ago. I was at just about eighty miles an hour, but short of the eighty knots I use as a rotation speed. The wind was entirely calm, but the plane pulled a little left for a moment, enough to yank me off the centerline by about five feet or so. My nephew Teddy and his girlfriend Laura were in the plane. We were going to fly up to Camarillo for breakfast at the Waypoint Cafe. It was Laura’s first flight in a little plane. On my last two Angel Flights I had tiny five percent surges on the left engine. Just barely enough to get my attention, and right after takeoff. So I glanced at the power meters and saw that the left engine had dropped to 85 percent. If I were alone in the plane I probably would have continued, but I pulled the throttles about a third of the way down the runway and started braking. The plane lands at about fifty-seven knots, and I was faster than that and beyond the thousand foot markers. I briefly locked the wheels twice as I braked as hard as I could. We watched the west end of the runway approach closer and closer as we bled off more and more speed. About a hundred feet from the end we were down to a fast steerable speed and I turned right, back onto the taxiway we had left a minute ago. I apologized to my passengers and we taxied back to the tie down. On Monday I called my mechanic. He said they’d need to get an engine log to start figuring out what it was. On Tuesday he sent up Abel with the laptop. Abel hooked it up to the serial cable that talks to the engine’s control boards and I fired up the engine. It had no trouble starting. It ran beautifully. Abel downloaded the historical data and the data from when it was running and headed back to Long Beach. If Elon Musk had designed my plane it would have done all that work itself over a cell phone connection and they would have called me to tell me what was up. They called back and said that the engine factory had looked at the data and saw no anomalies. I asked if he thought it was safe to fly it down to the shop, since it was nearly due for its annual inspection and he said he’d probably do a longer than normal run up, and a longer than normal hold on the runway with full power, but then he would think it would be fine. So I did that. And I held it at the end of the runway, firm on the brakes, while the engines wound up to a hundred percent, everything looked good and I let go of the brakes. I had briefed the take off (to myself, out loud), and if I had made it past the red line on my airspeed gauge then I would take off. If I hadn’t, and the engine dropped below 80%, I would stand on the brakes and stop the plane. When you are learning to fly in a single engine plane the stall speed is one of the things you focus on. It is represented on the airspeed indicator as the bottom of a green arc. If the white need is in the green arc? You can fly. When it drops out the bottom of it? Not as much flying happens. And, in an ideal world, when you are landing the airspeed slowly unwinds and just as your wheels are brushing the concrete the airspeed needle settles out of the bottom of the green arc turning you from a bird back into a truck. In multi-engine planes the stall speed is important for some maneuvers, but the two more important speeds are the blue line (best climb speed on a single engine) and the red line (minimum controllable airspeed on a single engine). I discuss it in detail in my post on the Grey Area, but the key is that below a certain speed, there isn’t enough rudder authority to counter the yaw induced by having only a single engine turning. So if you are in the air, slower than the red line, and you lose an engine, the results will be catastrophic and entirely out of your control. I am a control freak, I love being in control. So I wasn’t going to get in the air until I was faster than the red line by quite a bit. Just as I rolled past 800 feet from the start of the runway, the left engine surged for a moment. I glanced at the gauges and it had dropped to 40 percent and was still falling. I was nowhere near making the red line, so I was already touching the brakes. As I glanced out the window at the left engine it stopped turning the propeller entirely, or it was turning it so slowly that each time I glanced at out, it appeared to be stopped. I reacted with training reflex (identify the bad engine, verify it, secured it) and turned the master switch for the left engine to “OFF.” I rolled off the runway at about the spot I usually do on a good landing and switched to the ground frequency. I tried to turn right onto the taxiway, but with only the right engine going, the plane wanted to turn in a circle. I though perhaps I could get it rolling if I went in a tight circle and then popped out of it to go straight. The tower said that was okay with them, but I made no progress, I just went in a circle. So I angled into the ramp at Atlantic and the nice line people there towed me up to my parking spot. Dave came up and downloaded the engine data. We worried some about trying to get the left engine started since the propeller was in the feathered position. The started can’t turn the propeller fast enough when it against the wind like that, it just sort of whap-whap-whaps around and the engine doesn’t start. Fortunately, the moment he turned the key the propeller unfeathered, the engine turned and it roared to life. We keep it running until the engine coolant and oil are all warmed up. 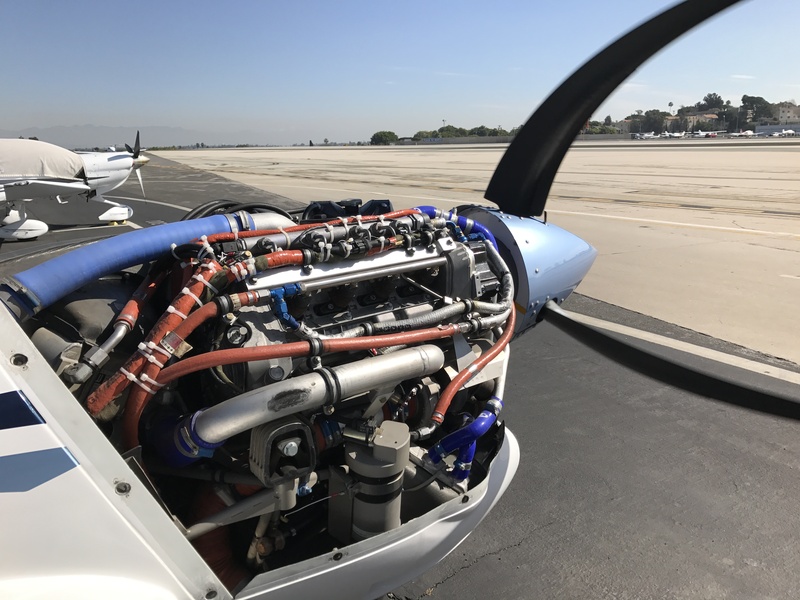 Technify (the engine company) says that we should run the engine at 100% for a minute and a half and then check the pressure in the propeller regulator valve (PRV). We taxi over to the high-power run-up area (right across the taxiway from my tie down) and Dave pushes the throttles forward while standing on the brakes. The engines roar for ninety seconds, not the slightest blip. We taxi back and he downloads the data. He hops out, takes off the cowl, hooks up his gauge to check the pressure, and has me run the engine at 1,500 rpm and 2,300 rpm while he peers at the gauge. At one point he has to lean in and his face is eight inches from the propeller and he’s staring at the gauge through the blur. I find this disconcerting. He has me shutdown and he twists a little set screw a quarter turn. We check it again. He says it’s good and we could take it for a test flight. He has me hold it a little longer than usual at the numbers, all the way at one hundred percent power, and then let go of the brakes. There’s not the slightest hiccup. We rolls down the concrete and climb up into the sky over the ocean. It is always beautiful to fly, but this is a strange ride since I am filled with adrenaline, but calmed by the fact that I have my mechanic on board and, so far, the plane refuses to misbehave if he’s near it. We land uneventfully. Later I wish that we had continued to Long Beach, dropped it at the shop, and taken a Lyft back up. I head to lunch and Dave returns to Long Beach. From there he calls and says the gearbox for the left engine needs to be replaced after fifteen more hours. We are within “the ferry time” for the replacement so he thinks we should just replace it. I am within a week of needing the annual done as well, my first with the plane, so we’ll just do it all at once. I just need to get the plane down there. There’s no reason to be proud when faced with these sort of things. I immediately sent an email to my flight instructor and asked if she’d accompany me on the ferry flight. It seemed like a really good time to practice some Cockpit Resource Management, a set of skills they teach airline crews (they love acronyms, so it’s CRM). One of us (me) would be the Pilot Flying. The other (Liz) would be the Pilot Not Flying and in charge of monitoring a specific set of instruments for a specific set of parameters. She read up on the plane (although she has flown the required five hours in it to qualify as an instructor) and watched some YouTube videos to see what single engine operations would look like. When she got there we went over the plan and I explained the 90 seconds of maximum power for 90 seconds. With the engines started and warmed we did our run-up (holding the two buttons for fifteen seconds) and then I held the brakes for a minute and a half with the throttles all the way forward. The plane shuddered and pulled and I realized Dave must have really been standing on the brakes to keep it in place. Finally that was over and I was able to drop the engines to idle. There wasn’t the slightest hiccup so we taxied to the hold short line. I told the tower we would hold on the runway for a moment before takeoff. They said that was fine. Onto the runway, throttles up and a quick check of the gauges. Brakes released and we were rolling. Liz watches the airspeed, I fly the plane, glancing at the power percentages. They never drop below 96% and most of the time just stay at 100%. Liz says, “Red line.” A moment later she says, “80 knots,” and I rotate. We go up like an elevator with a slight wiggle at the end of the runway so that we are flying over the golf course. The tower says, “Frequency change approved, that one looked a lot better.” He was the controller in the tower when I had to abort my takeoff with the engine shut down. Once we were at two thousand five hundred feet we were golden. Even if the left engine had surged and we had shut it down we would have flown on to Long Beach. I asked Robert Stewart if he had ever had a real life engine shutdown in a Twinstar. (He sold us out Diamondstar and knows a lot about the fleet.) He said that once over Santa Barbara one was getting rough and he shut it down as a precaution. “Did you land in Santa Barbara on a single engine?” “Oh, no. I just turned around and flew back to Long Beach on the one engine.” Such is the performance, I guess, of the Twinstar on a single engine. That was unnecessary for us. Uneventful take off to an uneventful flight and an uneventful landing. Just the way I like them. A Lyft driver brought us back up to Santa Monica. So the problem was the gearbox? Is that the newer engine or the old engine? Actually, I am not positive what the problem was. They adjusted the PRV pressure because it was a pound low (although within the allowable range). Then after the test flight it was a little high, so they adjusted it back down a little. It’s odd with a powerplant that is all FADEC and that to have this manual set-screw sort of setting. But the problem has not returned and the gearbox, which was at end-of-service-period, has been replaced.